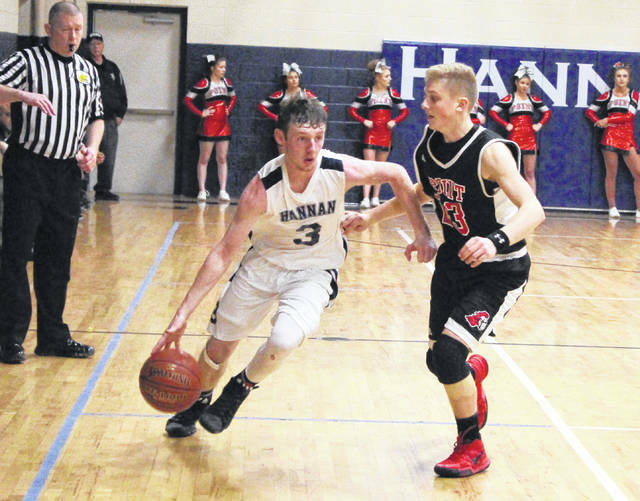 Hannan senior Malachi Cade (3) dribbles past a Point Pleasant defender during a Feb. 9 boys basketball contest in Ashton, W.Va.
Wahama senior Noah Litchfield (33) releases a shot attempt during a Jan. 24 TVC Hocking boys basketball contest against Southern at Gary Clark Court in Mason, W.Va.
CHARLESTON, W.Va. — Wahama senior Noah Litchfield and Hannan senior Malachi Cade were both chosen to the 2018 Class A all-state boys basketball team, as voted on by members of the West Virginia Sports Writers Association. 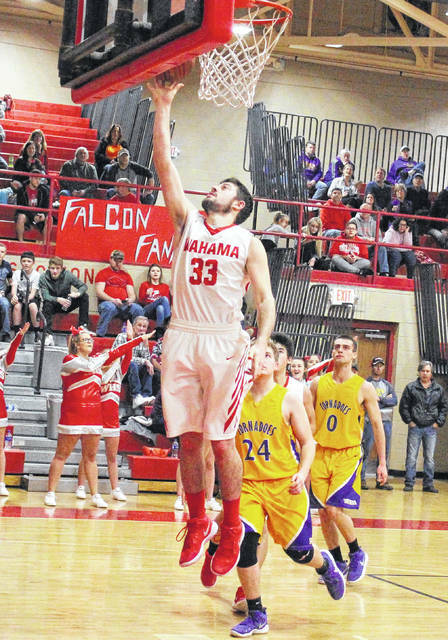 Litchfield — a 5-foot-10 guard — paced the White Falcons with 16.5 points and 6.6 rebounds per outing while connecting on 46 percent of his field goal attempts and 71.6 percent of his free throw tries. Wahama finished the 2017-18 campaign with a 5-18 overall mark. Cade — a 5-foot-11 guard — averaged 22.5 points, 4.4 rebounds and 2.2 steals per contest for the Wildcats, who finished the season with a 7-12 record. Cade — who shot 57 percent from the field and 61 percent from the charity stripe — became the seventh boy and 10th Wildcat in school history to surpass 1,000 points in a career. Cade is also Hannan’s first all-state selection since Tyler Burns — the program’s previous 1,000-point scorer — in 2015. It is the first all-state selection for both Litchfield and Cade in basketball as the Mason County duo was chosen to the honorable mention list. Isaiah Morgan of Ravenswood was named the first team captain, while Taylor Jarrell of Van was the second team captain. Noah Midkiff of Greenbrier West was chosen as the third team captain. Isaiah Morgan, Ravenswood (captain); Cade Ullman, Parkersburg Catholic; Brent Price, Wheeling Central; Tyler May, Tug Valley; Jay Moore, Greater Beckley Christian; Owen Gainer, Wheeling Central; Gabe Zummo, Notre Dame; Stephen Dawson, Ravenswood. Taylor Jarrell, Van (captain); Spencer Dean, Valley-Fayette; Nick Gipson, Valley-Fayette; Joseph Zini, Trinity; Noah Minor, Midland Trail; Griffin Phillips, Tyler Consolidated; Mason Layne, Tug Valley; Robby Williams, Charleston Catholic. Noah Midkiff, Greenbrier West (captain); Robert Milliken, Cameron; Tyler Gray, Webster County; Jonathan Blankenship, Tug Valley; Chance Potter, Greater Beckley Christian; Cullen Cutright, Williamstown; Landon Ridgeway, Paw Paw; Leo Herrick, Magnolia. Corrick Ambrose, Tucker County; Brent Barnette, South Harrison; Devon Brooks, Montcalm; Colby Brown, Cameron; Gunner Brummage, Clay-Battelle; Trenton Burdette, Wirt County; Malachi Cade, Hannan; Patrick Copen, Parkersburg Catholic; Levi Davis, Tug Valley; Logan Dilly, Pocahontas County; Chase Dunaway, Doddridge County; DeMoni Edwards, Mt. View; Jared Fagan, Notre Dame; Adam Falbo, Valley Fayette; Nick Fenstermacher, South Harrison; Logan George, Tygarts Valley; Jared Gladwell, Meadow Bridge; Todd Griffith, Notre Dame; Aaric Gross, Mt. View; Garret Haggerty, Moorefield; Nathan Hanshew, Midland Trail; Jacob Holliday, Richwood; Garrick Hopkins, St. Joseph; Eli Inman, Williamstown; Evan Lamp, St. Marys; Tanner Lett, Doddridge County; Noah Litchfield, Wahama; Cody Lowther, Webster County; Eric Maloskey, Sherman; Tyler Morlachetta, Buffalo; Collin O’Dell, Greenbrier West; Riley O’Dell, Greenbrier West; Bray Price, Wheeling Central; Trenton Reed, Union; Dylan Roberts, Tyler Consolidated; Jayden Rhodes, Ravenswood; Andrew Richmond, Summers County; Anthony Robbins, Wheeling Central; Matt Saxon, Paden City; Trey Scott, Cameron; Tony Sellitti, Madonna; Brett Smith, Tygarts Valley; Gavin Smith, Van; Wes Snyder, Tucker County; Levi Streets, Valley Wetzel; Chase Sullivan, Ritchie County; Cole Taylor, Webster County; Brett Tharp, East Hardy; Luke Vass, Fayetteville; Tyler West, Tyler Consolidated; Briar Wilfong, Pocahontas County; Daniel Woods, Trinity.